Copyright : This item is reproduced courtesy of Rural Press Limited. It may be printed or saved for personal research or study. Use for any other purpose requires written permission from Rural Press Limited and the State Library of South Australia. To request approval, complete the Permission to publish form. Since 1869 the Northern argus has served Clare and its surrounding towns. For 127 years the newspaper was run by the Tilbrook family. Brothers Henry and Alfred Tilbrook began working at the Register newspaper as young boys. Later working on station properties in the north they met Alfred Clode who was to become a partner in the Argus. 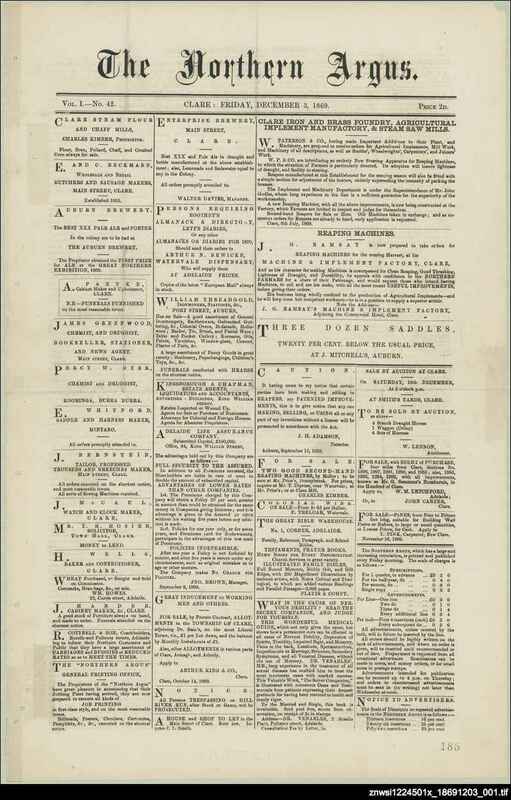 Henry Tilbrook briefly published a newspaper in the goldfields of New Zealand then returned to South Australia and in 1869 with Clode (whose two sisters married the Tilbrook brothers) Henry founded the Northern argus. Alfred Tilbrook joined the business when Clode left to run a newspaper in Japan. The Northern argus initially had six pages and cost twopence an issue - the standard price for a country newspaper at the time. The Northern argus gave the usual coverage to local news and sports, as well as including city and interstate news items. From 1874 to 1891 it was printed twice weekly. At this time, it contained large amounts of syndicated material - both literary and news items. Henry Tilbrook retired from the business in 1889, and Alfred Tilbrook, with Henry Tilbrook's son Reg, ran the newspaper. Robert Kelly was the editor until being ordained as a Methodist minister. His father, William Kelly (previously the Clare country correspondent for the Register) then became editor. While many other country newspapers were forced to close, the Northern argus was fortunate that Clare remained an important country centre and the town newspaper has outlasted many of its neighbours. For this reason the geographical coverage of the Argus has steadily increased. In 1996 the Tilbrook family sold the Northern argus to Rural Press. Based in New South Wales, this firm owned a large proportion of Australian country newspapers, and became part of Fairfax Holdings in 2006. The Tilbrooks also established two other newspapers, running the small newspaper, the Port Broughton echo from 1887 to 1888. In 1908 the Tilbrook family founded the Blyth agriculturist which was more successful than the Port Broughton venture, and was published until 1969. The Northern argus also had connections with the Kapunda herald covering part of the same district as the Argus, when Alfred Tilbrook's son Leslie went to work at the Herald, which he took over as proprietor in 1923 and owned until its closure in 1951.